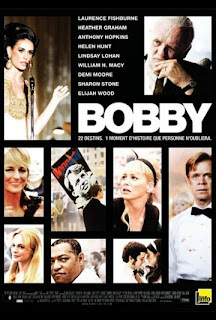 Just a casual glance at this image gives you a feel for the star power that was involved in this movie about the happenings at the hotel where Robert F Kennedy was shot. The actual shooting of Kennedy was somewhat incidental to the story that focused more on the culture and atmosphere of the late 1960s. I enjoyed it but wonder if younger people would.. not sure that non-boomers would catch the nuances of life during those years. I thought the decision to use actual footage of Bobby Kennedy instead of an actor helped give a bit of reality to the story. A few of subplots were a bit over-the-top but even so I give the move a thumbs up and, on a scale of ten, I give it ★★★★★★★. Kansas Bob, I have decided to award you the Stylish Blogger Award! Your nomination, award, and notification will be in my Friday, Jan 15th post. You can pick up your award by going to my site and clicking on the awards button and copying the award to your site. Congratulations! Has The American Dream Drifted North? Is the Fair Tax fair? Eleven for 11 and a Dancing Governator to boot!